Register now for your free e-newsletter! Physician Practice Insider brings together the targeted, quality content that physicians need, from news to expert advice applicable to individual healthcare settings. Physician practices have many of the same concerns that hospitals and large health systems do—but most must manage their equivalent compliance, coding and reimbursement, EHR implementations, safety, auditing, and other issues with more limited staffing and resources. 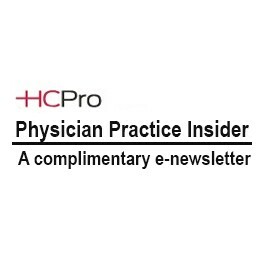 Physician Practice Insider eNewsletter will help them do so, bringing together the targeted, quality content they need, from news to expert advice applicable to their individual healthcare setting. CLICK HERE for a sample issue of Physician Practice Insider.